It is not the worst kept secret kept in football that Manchester City striker, Emmanuel Adebayor, is not happy at Eastlands. So could the 27-year-old be moving to the Madrid based club, Atletico Madrid? The Togolese striker had a successful loan spell at Real Madrid towards the end of last season; however Real do not appear interested in the striker. Atletico Madrid are awaiting the imminent departure of Argentina striker, Sergio Aguero. 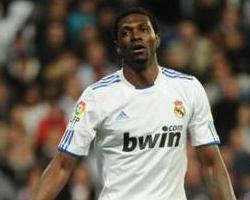 They are expecting to bring in €35m-€50m for the striker, money that could be spent on Adebayor. The Togolese international has been placed with the Manchester City reserves while the first-team tour North America. So Atletico could capture the striker at a reduced price. The striker has a successful career goal-scoring record with 124 club goals in 352 games. An impressive record, especially when you consider the Premier League (the league he has scored 61 of his goals) does not suit his style of play. The 27-year-old could set the Madrid outfit back €12m-€17m.